Mary Alice “Mab” Brannigan is helping out her uncle at Dreamland, an amusement park. Mab is in charge of fixing and repairing all of the amusement park rides and statues. Mab enjoys her work, especially since she is a bit of a loner. What Mab doesn’t know is that Dreamland is the home to five of the most dangerous demons. They were banished by a group known as the Guardia. The Guardia contained the demons’ souls in containers. The demons can never leave Dreamland. Ethan, Glenda’s son has returned home from the military. Glenda is one of the Guardia’s. Things quickly get out of control, when several of the demons escape and start causing havoc with the tourist. Kharos, the Devil is plotting his release and how he is going to take control. The Guardia with Ethan and Mab’s help must stop the demons before Kharos is loose and it is too late. Here you thought nothing could hurt you at an amusement park! It has been a while since I have read a Jennifer Crusie novel. This is the first book I have read where Ms. Cruise has collaborated with Mr. Mayer. Even though they have written several novels together. 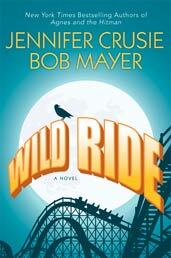 Wild Ride is one wild reading adventure…filled with excitement, thrills, chills, and laughs. Mab, Ethan, Glenda and the rest of the Guardia are a very likable bunch. They are like a dysfunctional family, who you don’t want to be seen with but still love and can’t get enough of. Paranormal and urban fans alike will enjoy this book. So why don’t you pick up a copy of this book today and take a Wild Ride. You won’t regret it. Watch out for the Hazard! It’s a Wicked Spring Giveaway! Watch out as he will cut your heart out! How to obtain the career you wanted online.